Bissell 32782 DeepClean Deluxe Upright Carpet Cleaner. alaTest has collected and analyzed 178 reviews of Bissell 32782 DeepClean Deluxe Upright Carpet Cleaner.. The average rating for this product is 4.8/5, compared to an average rating of 4.6/5 for other products in the same category for all reviews. Views about the design and size are generally positive. The price and usability are also appreciated, but comments are divided on the reliability. We analyzed user and expert ratings, product age and more factors. 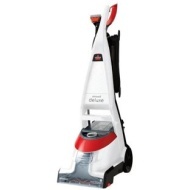 Compared to other products in the same category the Bissell 32782 DeepClean Deluxe Upright Carpet Cleaner. Is awarded an overall alaScore™ of 89/100 = Very good quality. easy to set up and easy and efficient to use. Very good purchase, exceeded expectations, defiantly recomended.